The financial markets have been on a roller-coaster ride ever since the results of the US election became known. As the election results poured in last Tuesday evening (November 8), the gold price surged to its highest level in over five weeks to $1,336.20 per ounce, its biggest one day rally since Brexit. The gold price lost some steam on Wednesday (November 9) in the aftermath of Donald Trump’s victory as the US president elect, and, on Friday around 85,000 gold futures contracts (over $10 billion ) traded pushing the gold price down from $1260 to $1230 an ounce. Gold prices ended the week sharply lower and have careened to a five-month low. Sell stop orders were triggered in the futures market when prices dropped below key support at the October low, to intensify the price downdraft. Gold prices are down more than $100.00 an ounce from the Wednesday spike high to $1,338.30, basis December gold on Come futures. The general consensus heading into the election was that a Trump victory would spell doom for stocks and as Trump’s odds were increasing during the election the Dow Jones nose-dived by 800 points while gold prices surged by almost $50 an ounce. However, by the end of the day, the Dow had pared back all of its losses and ended in positive territory, while the gold price gave back some of its gains. It was also interesting to see the huge swings in rate hike expectations throughout the session on Wednesday, which will likely be a key focus going forward given that the next meeting is one of the only major events remaining this year. There are various reasons which may explain this volatility. There is uncertainty surrounding how Trump’s win will affect the economy. The Federal Reserve’s decision on the interest-rate hike is coming in December. The stock market is wooing investors as it flirts with new all-time highs. Since the price of gold peaked on July 6, it’s fallen by around 11% percent, but I think the current pullback in gold is an opportunity to climb onto a trend that has much further to run. Fearful gold speculators will sell into near-term price weakness. Smart gold investors will use the current weakness to enter the market or add to positions with an eye to long-term profits. The price of gold could still continue to fall, of course, but the fundamentals that have been behind the precious metal’s rise in 2016 still lend support to the technical picture of gold. I urge investors to remain committed to gold as the fundamentals have not changed. The policy of negative interest rates (NIRP) is a failed experiment. By charging people to hold money in bank accounts, central banks hoped to encourage savers to put their money to work by buying things and investing in the economy. So far, this hasn’t worked, and in a world where investors must pay to keep their money in a bank account, precious metals are attractive by comparison – especially when prices look set to climb. As I have stated countless of times, since 2008, the expansionary monetary policy of central banks, namely quantitative easing is making paper currency less valuable. Printing money dilutes the value of a country’s currency. No one knows where this ends but in the meantime, NIRP is causing distortions and bubbles in many global markets. Faced with minimal or negative interest on bank deposits, investors are chasing returns in markets around the world. This drives asset prices to levels that are unwarranted by underlying economics. The “free money” being printed by central banks is inflating market bubbles in many equity and real estate markets. When bubbles pop, gold will be one of the safest places to hide, and its value as an alternative currency is likely to increase. In addition to the favourable fundamentals behind gold, a Trump presidency will have more of a positive impact on prices than a negative impact. Trump’s plan for economic growth centres on fiscal easing via lower corporate tax rates (from 35% down to 15%, according to campaign policies). Spending will also increase as infrastructure stimulus will be launched most likely on a massive scale. This reduction in tax revenues and increased stimulus spending will be paid for by issuing much more debt (think trillions of dollars over the next several years). This will be highly inflationary but it is unlikely that yields on government bonds will rise in fear of stunting any chance of economic growth. And with deficit spending eventually comes the devaluation of a nation’s currency and inflation. We’ve seen that story play out a dozen times over the last century. The U.S. will surpass $20 trillion of debt in the first quarter of 2017. Western governments are bankrupt, with hundreds of trillions in unfunded liabilities and a widespread pension problem that will peak during Trump’s first term in office with a wave of baby boomers retiring. There will be a currency crisis too – because investors and governments around the world will realize the U.S. dollar is not the safe haven it once was. Sooner than most people think, we’ll see the U.S. dollar lose its “reserve currency” status, and this will make it much harder for the US government to borrow money, and have military stationed in more than 150 countries. Meanwhile, India’s surprise move to abolish high-value bank notes has caused a financial crisis in the country. Prime Minister Namenda Modi surprise announcement came into effect the next morning. While the government stated that this move is primarily about bribery or terror financing, it is really intended to help the government clean up a system that has relied on cash to pay bribes and to avoid taxes, while drawing more people into the income tax net. Cash is so prevalent in Indian society that the ban came with a 72-hour exception for paying for hospital bills and airline tickets. India’s low-cost carrier, Indigo Airlines, sent an email warning customers that banned notes could not be used to purchase in-flight services or to pay excess baggage charges. A.T.M.s around the country were overrun Tuesday night with people confused about the plan and trying to complete financial transactions before the machines closed the following day. In some places, hundreds stood in line in front of a single A.T.M. Imagine waking up one morning only to find that the cash you have is worthless. Perhaps you are thinking this will never happen to me, but let me assure you anything is possible in the current political environment and corrupt financial system. Our entire monetary system depends on trust. A banknote is a piece of paper that says the bank will give the bearer another similar piece of paper, or make an entry in an electronic ledger for that amount. The system works because everybody believes that those pieces of paper will be accepted by everybody else and therefore, money serves as a useful medium of exchange. While this move has shaken that trust in India, it can happen to you wherever you are. I have often written about my mistrust for governments and what is going on in India is a perfect example of what governments are capable of doing. 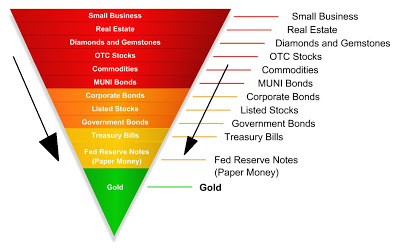 You need to protect yourself against such actions as well as the declining value of your respective country’s currency by owning physical gold and silver, particularly silver. You see in the case of a financial collapse, silver has one critical advantage over gold…silver becomes far more useful than gold for buying small, day-to-day items during a crisis. Gold on the other hand becomes too valuable. For example if gold goes to say $3000 an ounce, buying everyday items with a gold coin is not really practical…and you can’t cut it into pieces. So while short-sighted investors dump gold and silver, take this opportunity to add to your positions. Certainly there are no guarantees and investors should, but all signs point to a continuation of the gold uptrend in the months ahead.